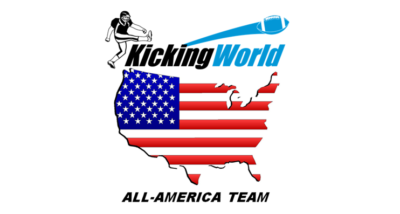 We detail the top performers from the Kicking World 2018 Northeast Regional Showcase held on August 19th at Passaic County Tech in Wayne, NJ. The competition only event saw big punting talent represented by multiple states across the east coast. The 2018 Northeast Regional Showcase at Passaic County Tech in North Jersey brought in some dynamite punting talent. Brian Cooey (Highland Regional HS, NJ), a Class of 2019 Punter/Kicker who also is his team’s starting Quarterback stood out from the crowd as the best punter of the day and one of our top punters of the 2018 Kicking World camp season. His competition-winning punt reached 48 yards with 4.88 seconds of hang time and he also connected on a 45 yard / 5.01 second punt during the elimination round. Most of his punts were consistently 45 yards or more in the 4.6-4.8 second hang times range, with multiple in the high 4.9s and low 5.0s. Brian clearly showed a D1 level punting leg. Immediately following this 2018 Northern Regional Showcase his recruiting efforts dramatically accelerated. Coach Brent personally sent off a video and brief synopsis to multiple college coaches in his network and Brian now has visits lined up with two BIG-10 college football teams and we would expect offers to soon follow. View Brian’s Hot Prospect profile for more video and full analysis. Gavin Dionisio (Archbishop Ryan HS, PA) a senior, was a perfect 100% during the field goal elimination round and perfect through 45 yards during field goal charting, leading the pack in both segments of field goals. He has a great attitude and shows a lot of potential. Pasquale Camastro (North Smithfield HS, RI) only a sophomore showed a big kickoff leg even during the wet weather. Tyler Logan (West Essex Regional HS, NJ) a junior showed spurts of solid field goal kicking ability finishing perfect through 45 yards but needs to improve overall duplicability. He also turned out some big punts at our July 2018 Toms River NJ camp and with some more tweaking on form and fundamentals, he could evolve into a solid collegiate recruit. In a smaller camp environment as it was on August 19th we are able to connect with each student on a personal level and obtain an even more accurate assessment of their ability and potential. We had a great day together even with the off and on rain, and look forward to each of these recruits’ improvement over this 2018 football season. For more info on any of the highlighted performers in this article, feel free to contact us directly. View competition results from every Kicking World Camp and see where you stack up. Ready to learn, compete, get noticed, and have fun? Find a Camp and get started today.